This week’s image shows us everyone’s favorite scourge – plague! Depicted below is Yersinia pestis, the causative agent of plague, sticking to the spines of a flea. Throughout history, Y. pestis has contributed to some of the most serious pandemics, at one point killing nearly half of Europe’s population. While plague still pops up occasionally (it’s endemic in the prairie dog population of the American Southwest), prompt treatment with antibiotics prevents serious illness. However, in aerosol form, unless antibiotics are administered in the first 24 hours, infection is almost always fatal. 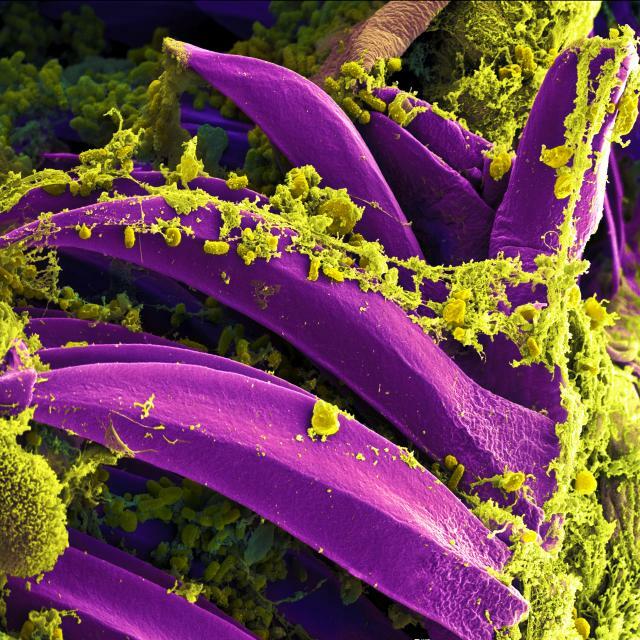 This is a big part of why Y.pestis is considered a potential bioterrorist agent.